Match ends, Sky Blue 1, Orlando Pride 1. Second Half ends, Sky Blue 1, Orlando Pride 1. Attempt blocked. Samantha Kerr (Sky Blue) right footed shot from outside the box is blocked. Assisted by Leah Galton. Offside, Orlando Pride. Josée Bélanger tries a through ball, but Becky Edwards is caught offside. Attempt missed. Lisa De Vanna (Orlando Pride) right footed shot from the centre of the box misses to the right. Dani Weatherholt (Orlando Pride) wins a free kick on the right wing. Attempt saved. Jasmyne Spencer (Orlando Pride) right footed shot from the centre of the box is saved in the bottom left corner. Assisted by Alex Morgan with a through ball. Attempt missed. 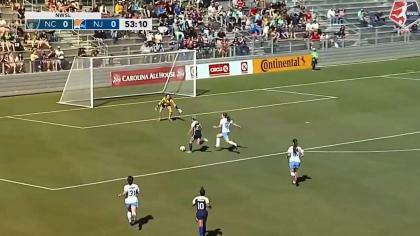 Samantha Kerr (Sky Blue) right footed shot from outside the box is close, but misses to the left. Assisted by Natasha Kai with a headed pass. Substitution, Orlando Pride. Lisa De Vanna replaces Jamia Fields. Attempt missed. Dani Weatherholt (Orlando Pride) right footed shot from outside the box is too high. Assisted by Kristen Edmonds with a cross. Corner, Orlando Pride. Conceded by Leah Galton. Corner, Orlando Pride. Conceded by Kristin Grubka. Attempt blocked. Alex Morgan (Orlando Pride) right footed shot from the centre of the box is blocked. Assisted by Josée Bélanger. Corner, Orlando Pride. Conceded by Caroline Casey. Goal! Sky Blue 1, Orlando Pride 1. Samantha Kerr (Sky Blue) left footed shot from outside the box to the bottom left corner. Attempt saved. Maya Hayes (Sky Blue) right footed shot from outside the box is saved in the centre of the goal. Assisted by Samantha Kerr. Sarah Hagen (Orlando Pride) wins a free kick on the left wing. Attempt blocked. Natasha Kai (Sky Blue) right footed shot from the centre of the box is blocked. Assisted by Erin Simon. Attempt missed. Alex Morgan (Orlando Pride) right footed shot from the right side of the box is close, but misses to the left. Assisted by Jamia Fields. Attempt missed. Sarah Hagen (Orlando Pride) header from the centre of the box is too high. Assisted by Josée Bélanger with a cross. Substitution, Orlando Pride. Sarah Hagen replaces Maddy Evans. Attempt saved. Natasha Kai (Sky Blue) right footed shot from outside the box is saved in the centre of the goal. Assisted by Sarah Killion. Attempt missed. Natasha Kai (Sky Blue) right footed shot from the centre of the box is close, but misses to the left. Assisted by Leah Galton with a cross following a corner. Corner, Sky Blue. Conceded by Dani Weatherholt. Attempt saved. Jasmyne Spencer (Orlando Pride) right footed shot from outside the box is saved in the centre of the goal. Assisted by Alex Morgan. Attempt saved. Samantha Kerr (Sky Blue) right footed shot from outside the box is saved in the bottom left corner. Assisted by Maya Hayes. Attempt missed. Maya Hayes (Sky Blue) right footed shot from outside the box is close, but misses the top left corner. Assisted by Natasha Kai. Offside, Orlando Pride. Jasmyne Spencer tries a through ball, but Jamia Fields is caught offside. Substitution, Orlando Pride. Jasmyne Spencer replaces Samantha Witteman. Attempt missed. Alex Morgan (Orlando Pride) right footed shot from outside the box is too high from a direct free kick. Attempt missed. Kaylyn Kyle (Orlando Pride) right footed shot from a difficult angle on the right is too high. Assisted by Kristen Edmonds. Attempt missed. 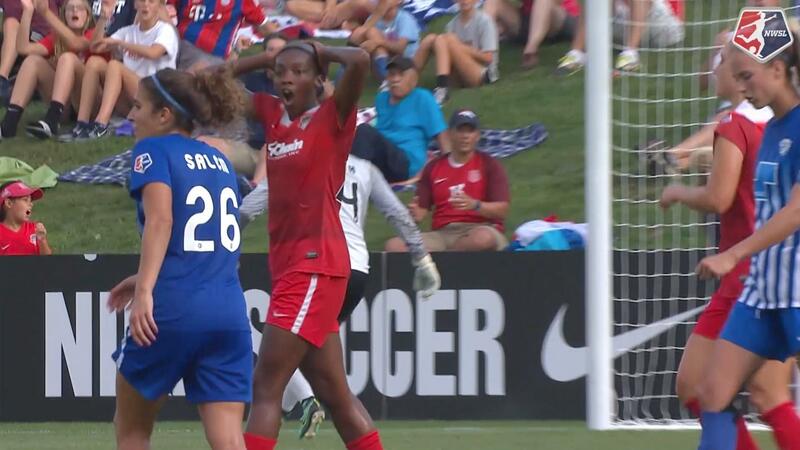 Jamia Fields (Orlando Pride) right footed shot from outside the box is too high. Assisted by Kristen Edmonds. Attempt missed. Natasha Kai (Sky Blue) right footed shot from the left side of the box is close, but misses to the left. Attempt saved. Leah Galton (Sky Blue) right footed shot from the left side of the box is saved in the bottom left corner. Assisted by Samantha Kerr. Natasha Kai (Sky Blue) wins a free kick on the right wing. Second Half begins Sky Blue 0, Orlando Pride 1. First Half ends, Sky Blue 0, Orlando Pride 1. Maddy Evans (Orlando Pride) wins a free kick in the attacking half. Attempt saved. 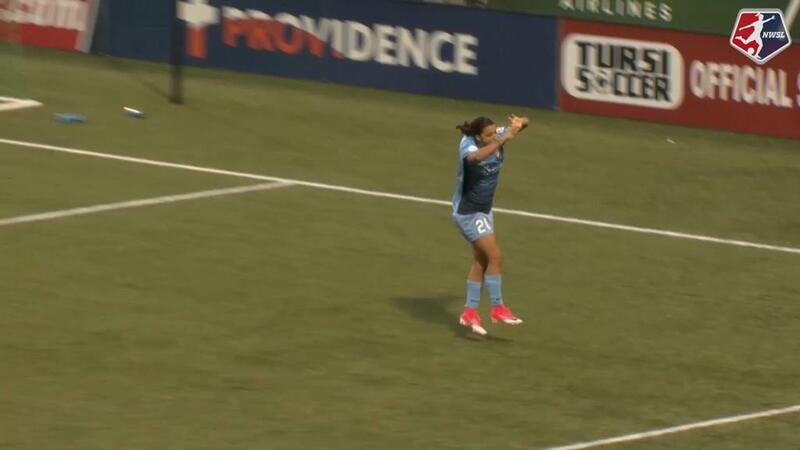 Samantha Kerr (Sky Blue) right footed shot from more than 35 yards is saved in the top centre of the goal. Attempt missed. Samantha Kerr (Sky Blue) right footed shot from outside the box is close, but misses the top right corner. Assisted by Leah Galton. Goal! Sky Blue 0, Orlando Pride 1. Alex Morgan (Orlando Pride) left footed shot from the centre of the box to the bottom right corner. Assisted by Maddy Evans. Attempt saved. Maddy Evans (Orlando Pride) right footed shot from the centre of the box is saved in the bottom right corner. Assisted by Kristen Edmonds with a cross. Camille Levin (Orlando Pride) wins a free kick on the left wing. Attempt missed. Samantha Kerr (Sky Blue) right footed shot from outside the box is close, but misses to the left. Assisted by Taylor Lytle. Attempt blocked. Alex Morgan (Orlando Pride) right footed shot from the right side of the box is blocked. Assisted by Maddy Evans.